Have you been wondering if the Black-ish TV show would be cancelled or renewed for a fourth season on ABC? 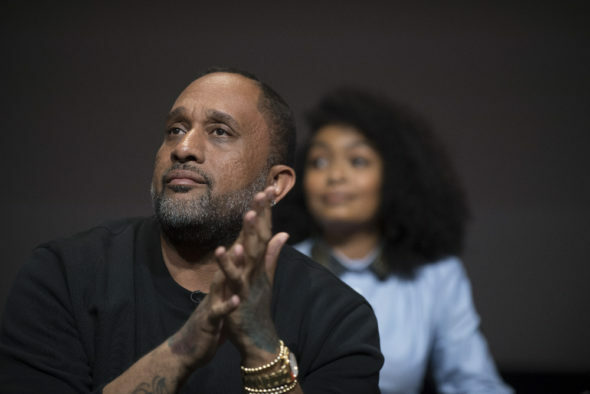 We’re pretty sure the family sitcom has season four in the bag, particularly now that creator Kenya Barris has agreed to extend his ABC Studios deal for another four years. Variety reports that per the new deal, Barris will continue to executive produce Black-ish, through his Khalabo Ink Society production company. Black-ish stars Anthony Anderson and Tracee Ellis Ross as Dre and Rainbow Johnson. The ABC cast also includes Yara Shahidi, Marcus Scribner, Miles Brown, Marsai Martin, Jennifer Lewis, and Laurence Fishburne. Black-ish Renewal on the Way? Kenya Barris Extends Deal with ABC Studios. Barris currently has a Black-ish spin-off in the works. The backdoor pilot centers on Shahidi’s Zoey Johnson, as she begins college. Larry Wilmore, late of the cancelled Comedy Central show The Nightly Show, is also executive producing and will serve as showrunner. According to the Variety report, ABC will decide on its fate this week. The Alphabet network will also decide whether to pick up Barris’ Libby and Malcolm comedy pilot, starring Felicity Huffman and Courtney B. Vance, as well as the Unit Zero dramedy pilot, starring Toni Collette. What do you think? Are you a Black-ish TV series fan? Will you check out the spin-off, if ABC orders it to series?